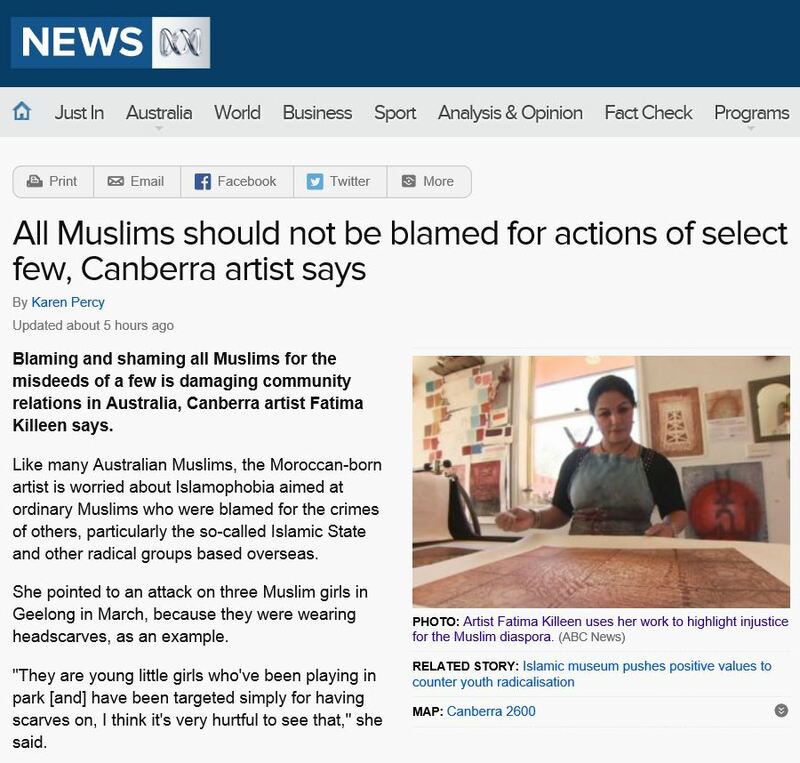 In an article accompanying the Australia Wide video story “When art and culture collide” ABC reporter Karen Percy talks with Fatima about her art and politics. Like many Australian Muslims, the Moroccan-born artist is worried about Islamophobia aimed at ordinary Muslims who were blamed for the crimes of others, particularly the so-called Islamic State and other radical groups based overseas. Over the years I have often been asked to comment on international and national current affairs. Film crews and reporters visit my home for various stories or content for documentaries. I have even been filmed preparing Moroccan food for several overseas cooking shows in my kitchen. The preparation to set up is quite technical and as I work together with the crews I have become firm friends with them as they tackle the unique problems at each different filming location. Sometimes small railway tracks for the camera dollies are clipped together to run through the house to smooth the transitions from room to room. The window sunlight often needs to be filtered then uncovered again for the close-up shots to reveal the views outside. A number of my artworks are on display in Australia’s national institutions and filming at these locations can be very challenging. Early morning starts are the norm as filming must be completed before the public entry times. The video equipment is wheeled in and out on carts through the many narrow corridors and large exhibition spaces. Noise free sound recording can be particularly difficult as much of the daily cleaning and exhibit maintenance is carried out in the morning hours before the institution opens. All of this leaves very little time for more than one or two takes before the gear is cleared away before the arrival of the public. Interviews for Moroccan radio and television are different. The interview has to be re-recorded several times in Arabic, French and English to accommodate audiences that speak different languages. This also allows the same interview to be used on the multi-language news programs aired at different times of the day. Fatima after an interview with 2M national TV at the MAC-A Gallery located on the beachfront in Asilah, Morocco. My most recent interview was the ABC Australia Wide program for a segment on “When art and culture collide” featuring the Islamic Museum of Australia. This interview shows my art displayed in the IMA and my comments were filmed in the studio spaces at home. You can watch the program at the times shown below or over the web on ABC iView for a limited time after the on-air dates. Here is a link to program: (segment starts @15mins 34 secs). I talked about the new Islamic Museum of Australia in my previous post – here is a link to an audio clip of the ABC Radio program The Spirit of Things with Dr Rachael Kohn. In the program Rachael talks about the museum with curator Nur Shkembi. Across the last few years my work has been displayed at museums in Canberra, Sydney and Melbourne. Two large works along with my life story and other personal items have been on permanent display at the National Museum’s Australian Journeys exhibition since the exhibit opened in 2009. One of the works, Wish you were here was specially commissioned by the National Museum for the exhibition and it hangs alongside another artwork made of wood, Tales of the Souk. Two of my Moroccan birdhouses also feature in the display. The NMA describes the gallery as “looking at the social, political and economic impacts of journeys beginning in the period before European settlement in Australia and continuing through to the 21st century.” I often revisit the exhibition to give talks to groups touring the Journeys gallery and the museum. The Conflicts 1945 to today exhibition opened at the Australian War Memorial in 2008. The large exhibition covers one wing on the lower level of the War memorial building. My collograph Besieged is one of four colour collographs about the Iraq war acquired by the AWM. The print is displayed with artworks of other international war artists. This major permanent exhibition covers the Gulf Wars, the war in Afghanistan, the Korean and Vietnam wars, the Malayan emergency and the Indonesian confrontation as well as peacekeeping operations. The gallery includes a full size Iroquois helicopter, the massive ship’s bridge of the HMAS Brisbane and an animated diorama of a battle scene in the Vietnam War. The Islamic Museum of Australia in Melbourne opened in early 2014. I have exhibited at the museum both individually and with the Australian Muslim Artists. My artwork titled Looted examines the illicit resale of antiquities stolen from Iraqi museums to international collectors and other major museums. The galleries of the Islamic Museum explore one thousand years of Islam in civilisation and the Muslim contribution to Australia since settlement in 1788. Last month I joined with other speakers and spoke about my work at the Islamic Arts Symposium held over several days at the IMA. Looted 2005 – on display at the Islamic Museum of Australia, Melbourne. Does Art Affect Social Change? For nearly two decades war has engulfed most of my thoughts to express my concern in relation to the humanitarian, the social, and the environmental impact that had on countries of conflict and how the American led wars have succeeded in turning them into zones of crisis. Arab and Muslim countries have become the testing ground for modern warfare, creating contaminated military landfill that polluted the soil and the waterways. America has deliberately decided against providing financial support to the local economies of Iraq and Afghanistan; they transported tons of prepackaged consumable goods into the country, eventually leaving years of waste material buried under discreet landfill. My work is an outcry and a desperate need for change, though sometimes I feel as if I am pouring water on sand while most people are disengaged and misguided about the social issues concerning migration, detainees and asylum seekers fleeing war entrenched countries. Social change can be engaging and stimulating to the creation of a tangible body of work asserting an artistic direction and social interest. Art on the other hand can be empowering to indoctrinate society, creating a social comity and a considerate behavior to others and all. Art is a visual language instantaneously recognized and able to shout out loud messages of various concerns. This can engage debates not only within small communities, but thanks to the social media it can amplify deliberations to other parts of the world. Financial conditions can either hinder the creative process of making a body of work that could comment on social issues or generate a stream of endless creativity with poignant ideas. Art is an engine of a thriving society where power is built on artistic creation, tolerance and critical thinking. It is not necessarily about making the perfect picture or artwork that matches the sofa; it is a conscious determination to make a statement in order to endorse respect and sustain the wellbeing of the global environment that we all share. 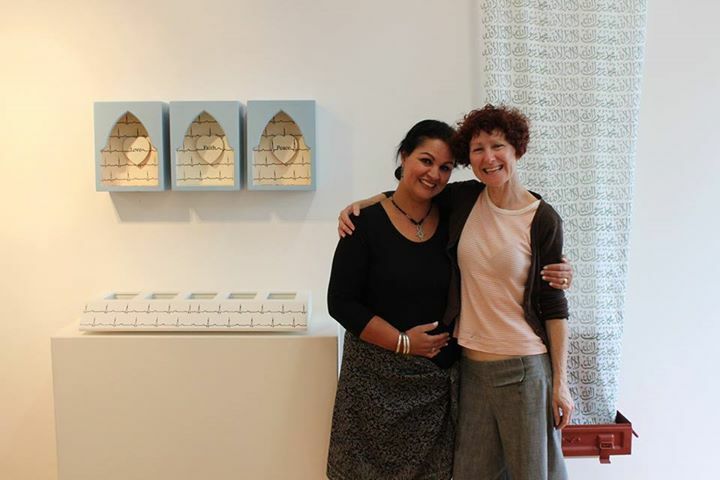 Fatima Killeen and Benita Tunks in front of the ‘The shroud has no pockets’ and ‘Awakening of an old flame 1 & 2’.